Day two of the Ulton, Ken’s Plumbing Plus & Lindsay Australia Bargara Ladbrokes Legends Pro-Am saw the players once again greeted by clear skies and light winds. The seeded draw saw 1986 Australian Open Champion Rodger Davis with an unusual morning time due to an uncharacteristic 77 in the first round. Davis took full advantage of the un-spoilt greens firing a 3-under par 69 which included five birdies and catapulted him up the field. “The greens were perfect and I putted as well as I have for a long time,” said Davis. The afternoon field saw overnight leader Martin Pettigrew shoot a solid second 68 for an 8-under total but it was defending champion Peter Senior who showed his class carding a 65 for 10-under total of 134. Seniors round included six birdies and an eagle with only one blemish a bogey on the strong par-4 ninth. 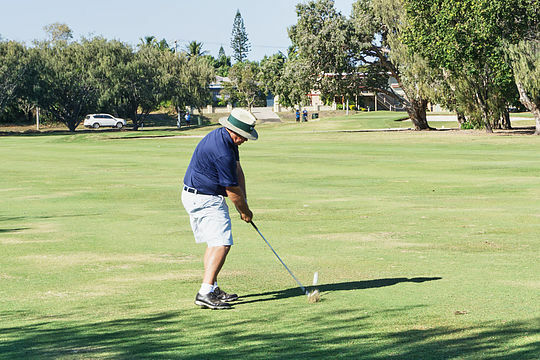 “I really enjoy coming to Bargara, the course really suits my game and the condition of the course was outstanding especially given the dry conditions in this part of the State,” Senior said.